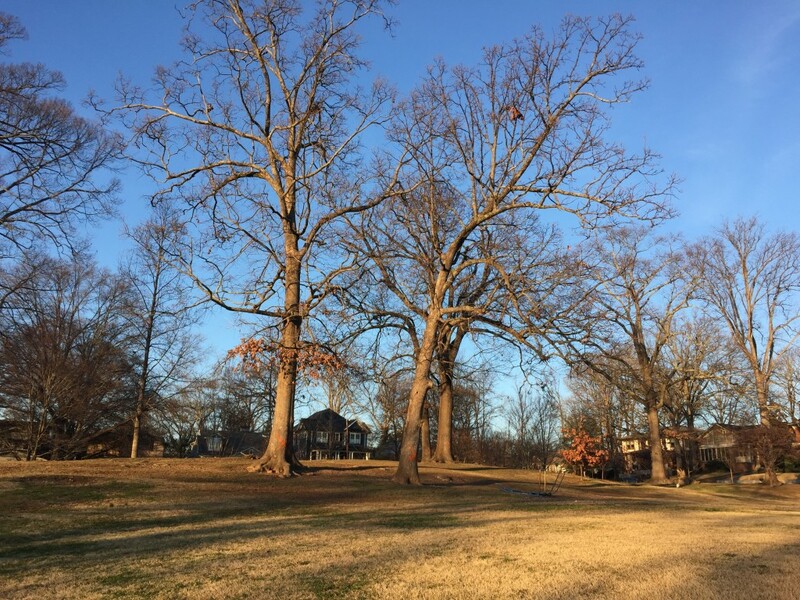 In addition to the judgment provided by the city Parks Department arborist on this project, we sought evaluations (both informal and formal) from other professionals, none of whom thought that any tree around the active classroom construction areas could be legally or practically saved. However difficult such opinions were to hear, the result was we found no known logical basis or legal support for an appeal to save these trees. The trees adjacent to the softball field were another matter. While the additions to the school building along Clemont and the new bus lane along Park had been shared and examined many months ago, no review of any field re-design had been offered for discussion or reviewed in any specific way by the Inman Expansion Committee or any other citizen group. Our dismay with this plan was especially acute because redesigning to accommodate the field’s large trees had always been an obvious and specific goal, along with providing upgraded facilities for Inman’s softball team (at least for practice and perhaps for games, if APS would accept a reduced field size.) VHCA had offered to provide funds for landscape architecture that would incorporate common design elements found both at John Howell Park across the street and at the Georgia Power facility on Ponce Place, and for hiring the very same firms to lead the process. The design phase of this part of the project – to enhance the field for Inman students and create a more visually appealing space for the community at the same time – had been estimated by APS as more than a year away. We anticipated and looked forward to a public approach that included citizen input into the process. The recent abrupt tree posting led to multiple discussions with APS, City Parks arborist Chris Kallio, the Tree Conservation Commission, and several private consultants, all in search of a full understanding of what was driving this design and proposed tree removal and an understanding of viable options. (VHCA Planning Committee member Chip Bullock was especially insightful in this regard). The day before the appeal deadline – and after at least one appeal had already been filed by a local resident – we met with Facility Director Alvah Hardy and Expansion Committee Co-Chairs Tamara Jones and Gail Price and asked again that the field trees proposed for removal be stricken from the plan, pending a full review of the goals and options, and that the Expansion Committee be reconvened to review the plans. Late Wednesday afternoon, Alvah reported that he had begun the processes we had all discussed and that the trees on the field would be taken off the list of trees to be removed pending an examination of these issues, which he hoped would not take more than a couple of weeks. In that regard, he specifically referred to a ‘temporary’ delay, awaiting the creation of a brand new design plan, which he was optimistic would result in reduced tree loss. He also noted that reducing tree loss would provide other design and project benefits. He anticipates filing an interim revised plan that excludes removal of the field trees by the middle of next week, ideally followed by a new version of a plan for the field by the end of the following week (which is, for reference’s sake, the end of the month). We appreciate this action and have thanked him for it. This provides an opportunity to reflect on the design goals and objectives in a larger and more thoughtful context. We understand the formal legal process as follows: the appeals that have been filed are scheduled for the Tree Conservation Committee hearing of February 18th (6:30 PM, City Hall Committee Room 2, or an adjacent space if needed). No tree work will occur on site pending the resolution of those appeals. APS is looking at alternatives for the field design. Unless there is a brand new decision by the school board to approach the capacity issue differently (and none are contemplated, to our knowledge), the scheduled construction will continue on its existing track this summer. With the pending appeals in place, many citizens remain very disappointed at the prospect of any tree loss, particularly for an expansion that some believe will not sufficiently address Inman’s capacity challenges and may not result in the pledged and promised removal of the trailers when the expansion is complete. While such issues are not a formal part of the plan to remove trees, they do raise anxiety levels in several contexts. One of them is APS’ promise that the trailers will leave the site at project completion, a topic that we have discussed several times with District 3 School Board Representative Matt Westmoreland. He has always plainly and publicly stated – at Inman this past fall and most recently in the last two weeks – that the trailers will depart upon the completion of the new addition. An improved field re-design does not ensure that any of us will be completely satisfied or pleased with the eventual outcome. What it should do is provide clear design goals and a chance for review and comment along the way. Such a process is not necessarily small-d democratic, nor does it threaten the primacy of school needs in the process. It does acknowledge that schools and communities have to get along as neighbors, understanding and considering the ways in which we impact each other and working together on solutions to mutual challenges. How hard can that be? We’ll keep reminding ourselves and all parties of the importance of making it happen.